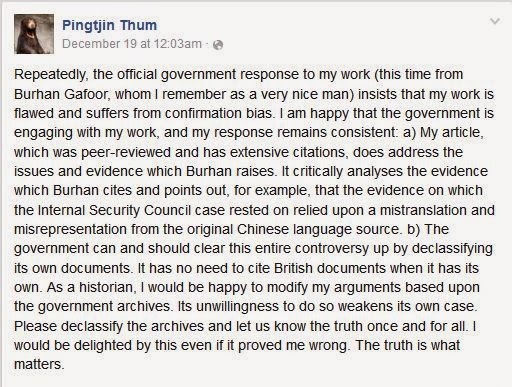 Thum Pingtjin responded to Burhan Gafoor's letter with a FB posting that he is “happy that the government is engaging with my work”; he claims that his article on Coldstore “which was peer-reviewed and has extensive citations, does address the issues and evidence that Burhan raises”. Thum's article does nothing of the sort. It fails to include several important revelations by Chin Peng, Fong Chong Pik aka The Plan, Eu Chooi Yip and other CPM/ABL leaders and activists that demolishes his arguments. Eu's revelations that the Barisan was formed on the instruction of The Plen completely undermines his whole thesis that the Barisan was just an ordinary left-wing political party instead of being the principal communist united front organisation (CUF) in Singapore that it was. His allegation that the CUF was an “invention” by the authorities has now been proven to be false. Click here to read earlier article on what Chin Peng and The Plen say in their own memoirs. In another article which also touched on Coldstore and merger, Thum declares that his work quoted extensively the Chinese press – did he know that The Plen has written in his book that many of the articles in the Chinese press originated from him? Many of these revelations have been in the public domain for the last 15 years. His entire unsubstantiated case against the government over Coldstore collapses now that it has been proven that the Barisan was indeed a political front of the CPM and that the communists were actively driving Barisan's disruptive activities and that the communists conspiracy was real and not imagined as alleged. Will Thum now revise his article? Thum's response to Burhan was a repetition of his old line that his article was “peer reviewed” as though that in itself authenticates his work as a truthful account and addresses all concerns about inaccuracies and misrepresentations. Since he relies heavily on peer reviews, and give the many misleading arguments in his article, readers are entitled to know who are these peers who reviewed his work and how were they chosen? What are their areas of specialisation and research interests? How familiar are they with Communism in Southeast Asia, in particular Malaya and Singapore? How familiar are they with Singapore history? Have they conducted research on Singapore history and politics? Further, would Thum address all the evidence and arguments highlighted in Burhan's reply in his forthcoming works on Coldstore or is it going to be an expanded version of his flawed articles? In particular, would he include all the revelations by Chin Peng, The Plen, Eu Chooi Yip and former CPM/ABL members that contradict his thesis? Would he also include the revelations and exhaustive research conducted by authors like C C Chin, Cheah Boon Kheng, Lee Ting Hui, Drysdale and Bloodworth and other British colonial records that argue against his own arguments? Like Thum, I too hope that the state would declassify more documents. But when academics do not use materials that are publicly available and shoddily analyse those that they have access to, then I wonder when that day will come.